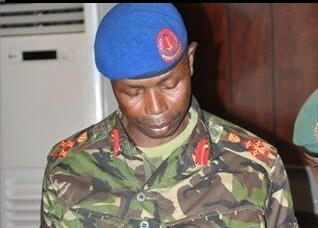 General Saul Badgie, Commander of the the elite State Guards and his entourage were disarmed before allowed entry at the Fajara military barracks, 8 miles from the Gambian capital city of Banjul. His mission to the army barracks was to talk to soldiers who are opposed to Jammeh's plans to declare a state of emergency today using a staged disruption of the gathering of his supporters at the Supreme Court to hear the appeal of the outcome of the December 1st elections. As reported during our previous blog post, a good portion of the military is opposed, not only to the planned state of emergency but to Jammeh's continued recalcitrant and obnoxious behavior in refusing to concede defeat to Adama Barrow. The lines appear to have been drown between a section of the military that has clearly decided that it is time to throw their support behind President-elect Barrow and his new government that is still in the formation stages. According to sources, General Saul Badgie and his entourage appeared rattled and visibly shaken by the incident. They were allowed entry only after being stripped of their guns. What he said to the troops once he gained entry into the barracks is unknown. What is evident from this and similar encounters in the past several days that have gone unreported is that the cleavage between two rival camps within the military is more pronounced now than at any time in the 22 year history of Yaya Jammeh's army. We will continue to monitor the situation as political events unfold including scenes at the Supreme Court where the Nigerian and Sierra Leonian judges that Chief Justice Fagbenle promised Yaya Jammeh have not reported for duty simply because they have not been recruited. The Nigerian judicial authorities do not want the image of their country sullied any further than it has already been because of the role they played in weaponizing the Gambian judiciary at the expense of justice and the rule of law. Chief Justice Fagbenle who was reported to have fled the country last week is still unaccounted for until this morning when he surfaced in Banjul to attend at a Supreme Court hearing.. And because he is central to the Supreme Court debacle, his recent unexplained absence dealt a severe blow to Jammeh's case of trying to have the Supreme Court nullify the elections. In a related development, Yaya Jammeh convened a meeting at State House yesterday amid mounting evidence that his Supreme Court strategy has crumbled and to shore up the sagging confidence and morale of his staff who have grown increasing weary of recent developments. He revealed to staff that he found evidence in IEC Chairman Alieu Momar Njie's phone that he was texting the results of the elections to Omar Jallow (OJ) before they were announced to the Gambian people as if this violates any law, if indeed it is true.